Built with deep baffle technology for glare-free illumination. Can take up to 2 optical accessories. Full black interior prevents 100% of all reflective glare. Untized optics guarantee proper alignment of lamp. All die-cast construction is for functional and aesthetic use. It was exactly what i'm looking for.nice fixture and design baffle trim. 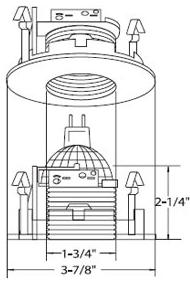 Click the button below to add the 3" 12v Low Voltage Pinhole with Baffle Trim to your wish list.